1. Combine egg, yolks and sugar and prepare a sabayon by whisking over a pot of simmering water until the mixture is thick, creamy and fluffy (it should be possible to ‘draw and hold’ a figure 8 with the whisk). 2. Add 1/3 of the lemon juice and whisk to the same stage as above, repeat process until all the juice has been used and the mixture is light and fluffy (its temperature should be approximately 70°C). 3. Remove from the heat and continue whisking to cool down. While still warm, whisk butter into sabayon and mix through sabayon until butter has melted. Pour into a container, cover and refrigerate until required. 1. Combine raspberries with sugar, water, Prue’s Verjus and lemon juice. Bring to a simmer, cooking gently without boiling for 5 minutes then turn off and allow to infuse for 20 minutes. 2. Strain through a fine sieve and leave pulp to drain through sieve without pressing (this may take several hours). Warm juice to blood temperature (around 37°C) and pour through a coffee filter. 3. Soak gelatine leaves in cold water for 10 minutes, strain and squeeze excess water out. Bring 100ml of the strained raspberry juice to a simmer then remove from the heat and stir in soaked gelatine leaves. 4. When gelatine leaves have fully dissolved, add the remaining raspberry juice, stir well and strain into a container to set. Refrigerate until required. 1. Halve peaches, remove kernel and place a knob of butter in its place, brush with lemon juice and dust with the icing sugar. Roast in a hot oven until lightly coloured; turn peaches over and roast for a further 5 minutes, remove and allow to cool fully. 2. When cool, remove skin and dice peaches into 1.5cm cubes. Chill and reserve. 1. 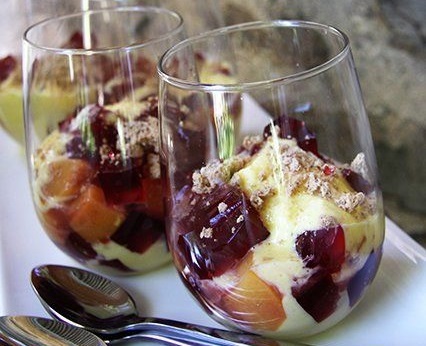 Dice jelly into 1.5cm cubes, place a spoon of lemon cream into each of 4 glasses, divide half the jelly between the glasses and then add half the peaches. 2. Repeat this layering process for a second time using the remaining peaches and jelly then finish with a final spoon of lemon cream. 3. Crumble an amaretti biscuit over each portion and serve immediately.